After a long flight and a short, restless sleep, my flight out of São Paulo touched down in Miami. Although it wouldn’t be my final destination for the day, it was my first stop on my return to the United States of America, which meant it was the place where I would have to clear customs before continuing on my way. Despite having done nothing wrong and having absolutely nothing to hide, going through customs, especially in the US, always made me feel a little uneasy, as though there could potentially be something wrong that I didn’t know about. It had been a bit nicer when I’d done the US pre-customs in the airport in Dublin, I’m not sure why, but this was the first time I would be clearing US customs in a US airport (coming back from Canada via train, customs had been a little stern but on the whole nothing to really worry about). Luckily it was pretty early in the morning when we landed in Miami – around 7am – so there wasn’t an awful lot of queuing or anything. Yet when I lugged my bag onto the X-ray machine, of course they decided it was worth pulling aside and taking a look at. “Yes, it’s my bag, and yes, I did.” I answered, half of me still asleep and half of me just a little on edge from being in customs. “Ah, well, yeah… I mean, there’s a bottle of bourbon I bought from duty free stuffed in there somewhere.” It’d been a good price, and I knew it was completely within the regulations. “What about down here?” he asked, looking back to the x-ray image before pointing to the bottom of my bag. I opened the bag to reveal some shoes, a belt, and my little black bag toiletries. “Can we please take a look inside that bag?” I resisted the urge to roll my eyes and groan, but he barely waited for a response before pulling open the zippers and poking his fingers around my toothpaste, my moisturisers, my sunscreen, my condoms… I mean, I didn’t have anything incriminating to hide, but it was a little uncomfortable to have him rifling through probably the most personal part of my luggage. The only thing worse would have been, I don’t know, going through my dirty underwear or something. Eventually he was satisfied that I was nothing but an innocent traveller, so once again I was on my way. I had to catch a monorail within the airport just to get the terminal from where my next flight would be departing, and once I was there I grabbed some breakfast and readjusted to the pleasant realisation that I was in an English-speaking country again. The layover in Miami was less than two hours, but by the time I got out of customs there wasn’t even that much of a wait before I was boarding again and onto my next destination: a kooky and mysterious port in the south-west of the country. When I’d been booking my flights back to the US from Brazil with my mother and travel agent over the phone, my mother had asked which city I wanted to fly back into. “No!” I remember saying at once. I was suddenly taking two whole weeks out of my original plan and flying down to Brazil, so I needed to move further west if I was going to catch up and eventually be in California for my flight off the mainland. I also knew that I wanted to be back in the US by the 31st of October to make sure I was in the country for Halloween. As an Australian, I’d never really properly celebrated Halloween, at least not in the way the Americans do it, so I was determined to be there for it. When brainstorming cities and places of where to actually spend it though, most people had suggested the bigger coastal cities. I knew that I would have already left the east coast by then though, and with a few months left of travelling afterwards, it seemed too soon to be heading to the west coast for Halloween. When I scanned the map for more centrally located cities, I couldn’t believe that I had completely overlooked it until then. So when she asked me where I wanted to fly back to after two weeks in Brazial, arriving the day before Halloween, I knew exactly where I needed to go. When I’d met up with my dad in New York, he’d surprised me with a birthday gift. Well, not so much as a gift as an offer. It was the night before the both of us were flying out of New York, so we were talking about future plans, and where I’d be going in Brazil, and then beyond that. After the continual months of Couchsurfing and crashing at hostels, I don’t think my father quite realised how much I would, in fact, like that. I thanked him with a big hug, and he told me to email my mother to sort out a booking. Jump forward two weeks and I was loading my bags into a hotel shuttle bus at the Louis Armstrong New Orleans International Airport, the sunshine beating down on me and the air thick and humid. There were a plethora of different accents around me, and as we drove into the centre of town our driver gave us a warm welcome and a little commentary on the passing scenery. Luckily, the Royal Hotel New Orleans was the first stop on the shuttle route, and that happened to be where I was staying. As the shuttle rounded the corners and puttered down the streets, I suppose the first thing I noticed about New Orleans was that it didn’t really look like an American city. In fact, parts of it seemed distinctly European. A little bit of later research would inform me that this is was because we were in the French Quarter, the oldest neighbourhood and, for many, the cultural capital and the obvious touristic focus of the city. There weren’t as many two storey houses and big green lawns as there were cute little layered terrace houses, wrought iron fences, and beautiful, historic architecture. My hotel was no exception, and as I was shown the way to my room I was led through a gorgeous courtyard that made me feel like I was staying in some kind of sanctuary villa. 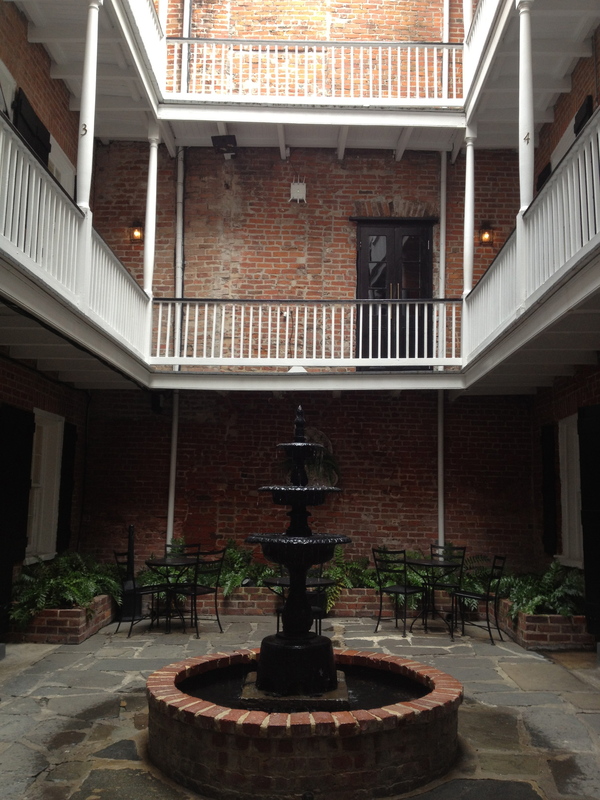 The courtyard in my hotel in New Orleans. The first thing I did when I arrived was take a nap. There isn’t a lot of change in the time zones when flying from South America to North America, but it’s still a long flight, and I hadn’t had the best sleep during any of it. It also felt quite odd to be in a hotel for once, with my own room, a nice big bed and a private bathroom. There was no weird small talk between travellers like there is when you arrive at a hostel, and I didn’t have anyone to introduce themselves or offer to show me around, as is what usually happens when you first arrive with a Couchsurfing host. I obviously don’t mind doing any of that, but for once none of that was happening, so I took a few hours to rest, recuperate, and recover from the long haul travel. While I hadn’t needed to find a Couchsurfing host to stay with when I first arrived, I was only staying in the hotel for a couple of nights, and I’d had a feeling I’d want to be in New Orleans for a little bit longer than that. So I had done a bit of browsing through potential hosts and gotten in touch with a few, asking if they’d be interested in meeting me when I arrived and potentially hosting me when my time in the hotel was over. And that’s how I came into contact with Brett. He was a self-described shaman, though given the mystical nature of the town and New Orleans being the home of voodoo within the US, that wasn’t at all surprising. I consider myself pretty open-minded and curious when it comes to spiritual or supernatural things, and where I come there isn’t anything quite like the presence that voodoo and magic have in New Orleans. All I knew is that I didn’t want to be one of those tourists who goes to New Orleans and does nothing but party on Bourbon Street – without exception, every single profile on Couchsurfing had said that they were not interested in those kinds of people, who were clearly just looking for a free room on a boozy vacation. In my messages I’d described my situation to Brett, as well as hinting that I was curious about his shamanism, and so we’d arranged to meet that afternoon after I was feeling recovered from my flight. Brett lived just north of the French Quarter, and an easy walking distance from my hotel, so in the afternoon I headed over to introduce myself. He was a nice guy, probably in his mid-40s with a grey head of hair. He wasn’t a native to New Orleans, but had been a resident for a long time and it was his home, so we chatted and he told me a bit more about the city, some of the local geography and history. He also gave me a few tips of good places to eat and drink around the Quarter, as well as warning me to be keeps my wits about me when walking at night. And then we got talking about the shamanism. Out of respect for the practice, I’m going to try and explain it fully because I didn’t really understand it. The bottom line is that shamans work with spirits and by doing so, reach altered states of consciousness through transcendental energies, which may or may not allow them to achieve certain supernatural things. He offered a demonstration, and even now I’m not 100% sure what he was supposed to be demonstrating. Maybe my heart wasn’t in it, or I was just too tired and jet lagged from the flights, but it didn’t really feel like any more than an intense guided meditation. Which, don’t get me wrong, can still feel deeply spiritual. 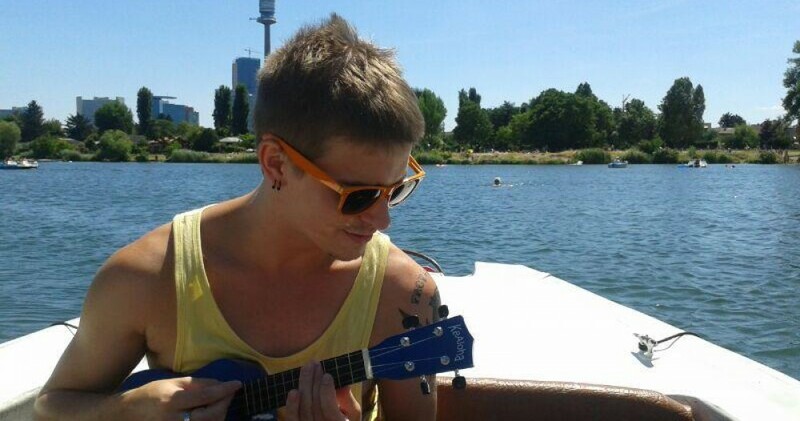 But it wasn’t really a new sensation for me. It wasn’t exactly magical. To be honest, I felt a little skeptical after the whole thing, and while Brett had been a nice guy, I didn’t feel like I needed to hang out with him anymore. It had been an interesting experience, at least, and I actually did feel a bit more relaxed after what had essentially been a meditation session. However, the night was young, and New Orleans still had many more surprises and adventures in store for me.